Both men and women wear jewellery. We love to decorate ourselves with light and colour. Beautiful stones andpearls are precious and lasting gifts for special occasions. Red ruby, blue sapphire and green emerald are treasures along with tourmaline, amethyst and garnetto name only a few of my favourites. The two main cuts are sparkling facets or smooth surfaced cabochon. Diamonds reflect and divide light into all the colours of the rainbow and are the hardest of all gem stones. A silver ring set with a cabochon green stone and a silver ring inlaid with 18ct. gold. 18ct. 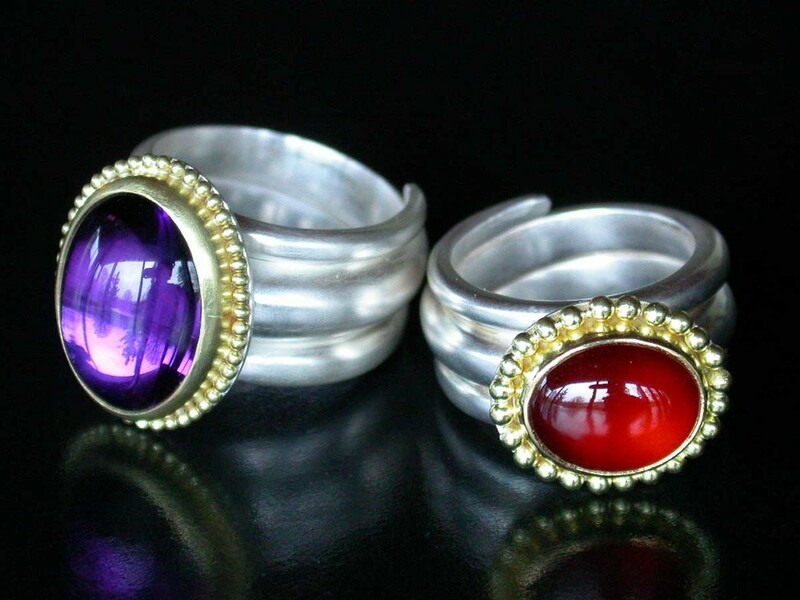 gold rings set with cabochon amethyst, emerald and tourmaline. Every precious stone is different. In this case a soft blue aquamarine is set off by yellow and white gold. A dark blue sapphire looks good in yellow gold on a silver shank. Two coiled silver rings with 22ct. gold around the settings. The cabochon stones are garnet and amethyst. These rings could be mediaeval or modern. Some designs are beautiful forever. Silver, gold and lots of different coloured cabochon stones. This 18ct. ring is yellow gold on the outside and lined with white gold inside the shank. It is set with a sparkling blue tanzanite stone.